Restoration construction at Miraflores may appear to be at a standstill for the moment, but new plans are in the works. In December 2016, the City approved a new phase of restoration to construct a walkway through the garden, but original walkways unearthed a year ago in July 2017 during initial construction resulted in a revision of plans. According to Lynn Bobbitt of the Brackenridge Park Conservancy, the plan is to create a stable walkway from the Brackenridge Park entry bridge to the Hildebrand gate, which will allow for tours onto the property that could attract private partners interested in contributing to the garden’s restoration. 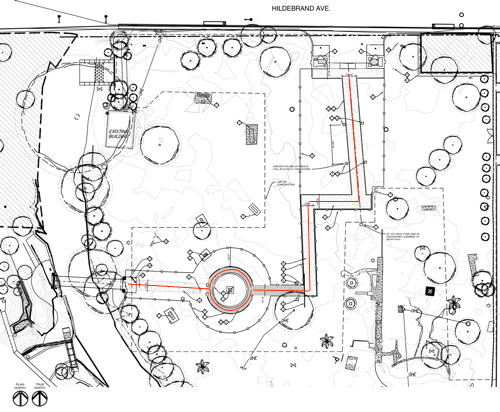 The walkway will travel around a reflecting pool containing a statue of Dr. Aureliano Urrutia, the garden’s creator. The City's 2016 plan for a walkway from the Brackenridge Park Bridge entrance to Miraflores to the gate at Hildebrand included one circular walkway around the reflecting pool. The walking path is indicated by the red line. The scales of this drawing and the sketch below are approximately equivalent. Photo courtesy of RVK Architects. Used with permission. Upon initiating construction of the walkway, it quickly became apparent that Urrutia’s design of the reflecting pool area, which occurred between 1930 and 1940, differed significantly from the City’s original plan. I contributed information gleaned from the family archive to help the City better understand what else may lie below the surface (which had been buried by tons of infill sometime in the late 1970s/early 1980s). In response, the City authorized further exploration of the site. Everyone involved in the project marveled this past spring as Urrutia’s original design emerged. From there the project architects, RVK Architects, set about revising the plan, which the City is now reviewing prior to submission to the Texas Historical Commission for approval. My sketch, shared with the City, showing the compass rose style design of the plaza with a double circular walkway system as indicated by analysis of the site and historical photographs. The diameter of the plaza, with its four quadrants, is approximately 150 feet. Each quadrant was densely planted and also contained benches. The pathway exits the plaza to the north instead of to the east, utilizing more historically accurate pathways and driveway. Drawing by Elise Urrutia. In contrast to the single circular walkway as originally planned, the area around the statue is more complex. A large plaza, approximately 150 feet wide, with two concentric circular walkways—inner and outer circles—forms a compass rose design, with the reflecting pool at center and north-south and east-west walkways forming four quadrants. Photographs reveal trees, shrubs and other plantings, along with benches, in each quadrant to form a room-like garden around the reflecting pool. The outer circular walkway met a driveway at its northern-most point. The driveway ran east-west from the summerhouse on the property intersecting with the north-south main driveway coming in from Hildebrand. Urrutia called this area the Plaza del Centenario. It was named for Friar Pedro de Gante, who in 1530 established the first colonial school in Mexico City. Along the edge of the reflecting pool is a commemorative inscription etched in the concrete rim. Why the word centenario? The word translates to “centennial” or “centenarian.” And Urrutia built the beautiful reflecting pool in 1930, four centuries after de Gante’s accomplishment. Originally the pool had a mosaic fountain urn at center, but in 1940, a grateful Mexican patient gifted Urrutia with the statue of the doctor, sculpted by the famed Mexican sculptor Ignacio Asunsolo. The statue originally faced east toward the center of the garden, but with a recent restoration was turned 180 degrees to face the Brackenridge Park entry bridge. Plaza del Centenario was also a fitting name for the Plaza, in sort of a prescient way, since Urrutia himself was destined to reach the age of 100, 42 years later, in 1972. The new design proposes to reuse thousands of original pathway bricks, and includes a hidden drainage system beneath the restored walkway to help handle water in this flood prone area. “The park is in the flood plain, and when the water comes up over the bridge, this too will be under water. We will have to do some cleaning, but this will help. We hope to find some stewards who will help us manage the restoration and maintenance costs. This is a specialty park,” said Bill Pennell, project manager for the City, on a recent visit to the garden. Pennell says the amended scope will complete the brick walkways that form the Plaza area, including the drainage system, with some landscaping and irrigation. 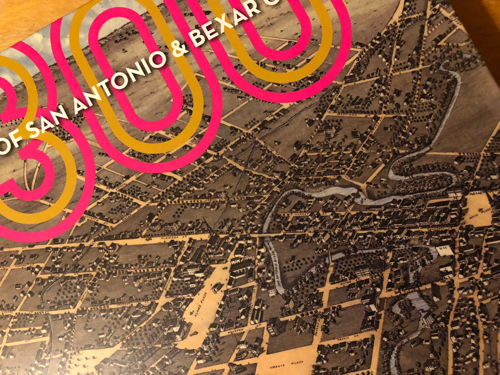 The remaining connections between the Plaza, the Brackenridge Park entry bridge and the the Hildebrand gate will come next as funds become available, and will also draw on new information to be more historically accurate. Miraflores is the unique garden expression of Dr. Aureliano Urrutia, who came to San Antonio from Mexico City in 1914. Created primarily from 1921 to 1945, the garden still contains a number of significant objects reflecting important aspects of Mexican history, art and culture; some of which are on the Smithsonian Inventory of American Sculpture. It is on the National Register of Historic Places (2006), and is a State of Texas Archaeological Landmark (2009).